Though credits have rolled on the new Doom, I wanted to keep blowing up imps and pinkies. It seemed like the right time to revisit Doom 64. 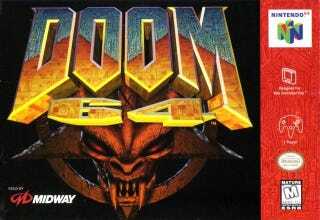 Doom 64 wasn’t actually developed by id Software; it was created by Midway Games. It picks up after the events of Doom 2: Hell on Earth, when attempts to purge the previous demonic invasion through radiation blasts fail to destroy a being capable of resurrecting the demons. Your experience with the horde prompts the government to send you back in. Doom 64's release in early 1997 was memorable for a few reasons. One, it wasn’t a straight port of Doom, which had been dragged around from machine to machine for years. Doom was starting to get a little repetitive. Two, Doom 64 arrived during a drought in releases for the Nintendo 64. (You could only collect the 120 stars in Super Mario 64 so many times.) And though Doom 64 was overshadowed by the release of Turok: Dinosaur Hunter a few weeks prior, Doom 64 holds up a whole lot better than ol’ Turok. What’s so immediately striking about Doom 64 is that it’s treated as a reboot, visually speaking, even if it retains the base mechanics of Doom. The game is brutal, too. I mean, the first level opens with players being shot at by enemies locked in a cage. When I started playing, I died in the first 30 seconds without firing a single bullet. OK, Doom 64, I’m listening. Otherwise, it’s a straightforward but excellent Doom game. You shoot demons, you collect key cards, and find the exit. Rinse, repeat. I shot my way through six levels before realizing I should probably get back to work. Doom 64's cult status has circled for years, with fans going out of their way to keep the game current. Doom 64 EX is faithful version of the game on PC that’s been updated with access to modern resolutions and other helpful tweaks. It’s gorgeous, as far as Doom games go. Despite Doom 64 having been released in 1997, Doom 64 EX is still being updated. And I won’t forget you either, Doom 64.